Omaha, Nebraska EOD from the 155th Civil Engineer Squadron responded to a call from the Omaha Police Department's (OPD's) Bomb Squad after an old military ordnance was turned in on fireworks amnesty day. The day is offered to provide the opportunity for citizens to turn in illegal items such as weapons, fireworks, or military ordnance without penalty. The 8-inch diameter projectile had no visible markings and luckily was not live. The bomb squad properly disposed of the munition which the prior owner had reportedly modified by welding two bars onto the side to use it as a door stop for his barn. 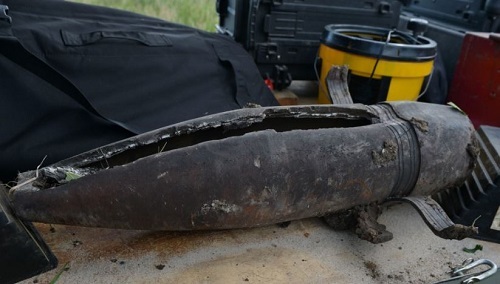 Concerned that others may try something similar, the bomb squad issued a public release reminding the public that ordnance can be deadly, even if it is very old, and that ordnance should never be modified or handled in any way. Comments are not allowed for this entry. BlogCFC was created by Raymond Camden. This blog is running version 5.5.002.